Many people already know we have former NFL player and commentator John Madden to thank for Turducken’s sudden rise to fame. Madden was known for waxing poetic about the roast beast—a turkey stuffed with a duck stuffed with a chicken—live on the air. Sometimes he even brought one of the concoctions into the broadcasting booth. 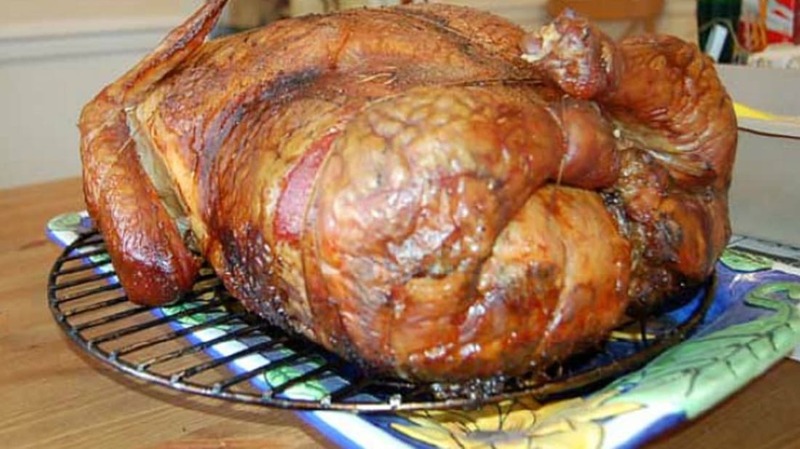 As far as extreme holiday entrees go, Turducken is no longer the only option out there. If you’re looking for something new for your feast this year, gorge yourself on these 11 alternatives. Turkey may be a holiday go-to in the U.S., but in the UK, it’s more common to see a goose on the dinner table. That’s where the gooducken comes in—a goose stuffed with a chicken stuffed with a duck. What do you get when you cross a 20-pound pig with an 8-pound turkey, a 6-pound duck, a 4-pound chicken, a Cornish game hen, a quail, lots of bacon, 6 pounds of butter and a splash of Dr Pepper? You get the TurBacon, created by the crew at Epic Meal Time. They’re also responsible for the Turbaconepicentipede, which is an unholy Human Centipede-like configuration of many TurBacons. If a turkey and a pig could have a baby, it would be the cockentrice. But they can’t, obviously, so folks back in Henry VIII’s day did the next best thing: They went mad scientist and sewed the upper half of a piglet to the lower half of a turkey or a large chicken. Then they stuffed it, roasted it, and served it for the amusement of royal guests. Also dating back hundreds of years is the Rôti Sans Pareil, the Roast Without Equal. This massive dish involved the engastration of not three, not four, not five, but seventeen birds. It was one of each of the following, in order from smallest to largest: warbler, bunting, lark, thrush, quail, lapwing, plover, partridge, woodcock, teal, guinea fowl, duck, chicken, pheasant, goose, turkey, giant bustard. We don’t know if people actually made the monstrous meal, but the recipe was included in an 1809 food journal called Almanach des Gourmands. “Recreational mathemusician” Vi Hart takes the bird in a bird in a bird concept to a mathematical level. She stuffs her turkey with two ducks, then stuffs each duck with two hens, and finishes off with two quail eggs per hen. In 2011, Rusty Eulberg and his wife wanted to do something “unique” for a Christmas dinner with their friends. Inspired by H.P. Lovecraft’s Cthulhu, the couple combined a turkey, crab legs, octopus, and bacon, resulting in a main course that horrified their dinner guests. But unlike the other Turducken variants, the cthuken isn’t assembled and cooked—it’s cooked and then assembled. Once their surprised friends were able to get over the appearance of the Frankensteined creature on the table, everyone was able to disassemble the thing and enjoy their favorite meat(s). In a stunt aimed at mocking how far we've taken the engastration trend, an Australian radio show combined 20 different meats, outdoing even the Roast Without Equal. The meats, in order from smallest to largest: Pigeon, partridge, quail, guinea fowl, rabbit, chicken, duck, pheasant, turkey, goose, mutton, beef, emu, goat, water buffalo, oxen, kangaroo, camel, venison, whole baby pig. Loosely based on the 12 days of Christmas, a farmer in England cobbled together this beast made from turkey, goose, chicken, pheasant, partridge, pigeon squab, Aylesbury duck, Barbary duck, poussin, Guinea fowl, Mallard, and quail with herb and fruit stuffings. And while you might not be pleased if your true love gave you a Christmas present consisting of a bunch of random game stuffed into a carcass, you might at least be comforted by the fact that it was an expensive gift: It costs £665 (about $1011). If you can’t afford 12 different birds to construct the True Love Roast, or even three birds for the legendary Turducken, there’s always the option of one bird and some meat-like filler. Introducing the Hotchken, a chicken stuffed with hot dogs. Yes, it’s a real (but borderline NSFW) thing. If you’re both a lover of wordplay and a glutton for punishment, give the TurDunkin’ a try. Unwholesome Foods created it, and while it’s certainly unwholesome, it's only technically a food. First, a turkey is brined in Dunkin’ Donuts coolattas, both orange and strawberry. The “stuffing” is made of 50 munchkins of assorted flavors, plus onion, sage, and vegetable broth. (Mmm.) After cooking, the turkey is glazed and coated in sprinkles. The finishing touch is a drizzle of coffee-flavored gravy. If the idea of meat stuffed in meat stuffed in meat stuffed in meat makes you want to look into vegetarianism, don’t worry—there’s still a “bird” for you. Created by blogger Dan Pashman, the Veggieducken is yams stuffed into leeks stuffed into a banana squash, with layers of vegetarian stuffing in between. To complete your meal, you might as well stick with the theme of food stuffed into other food with the Cherpumple. That’s a cherry pie baked into a chocolate cake, a pumpkin pie baked into a spice cake, and an apple pie baked into a yellow cake. The cake/pie layers are then stacked and frosted to create a layer cake of epic proportions. Hope you brought your Thanksgiving Pants.